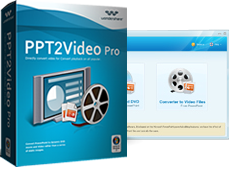 With PPT2Video Pro, you can convert your PowerPoint presentations to videos of WMV compatible with Zune for view PowerPoint files on Zune anywhere, anytime at your convenience. Convert PowerPoint presentations to WMV compatible with Zune. Customize video resolutions: 240*160, 320*240, 368*208, 480*270. WOW your audience by viewing PowerPoint on Zune. Create video with voice-overs from PowerPoint and share by iTunes, email, Web, YouTube. Share PowerPoint presentations on Zune offline. Assign the homework online for students’ subscription and downloading to Zune. Study for tests on the move with the WMV video compatible device. Learn about places of interest on your Zune as you travel.